2003MalaysiaResort_19-22sep -- The cab driver takes us efficiently to the boat station where we arranged for the trip out and made some last minute decisions about which resort would be most convenient for snorkeling. Our destination would be the Coral View Island Resort on the island of Pulau Perhentian Besar 21 kilometres from the north-east coast of peninsular Malaysia. 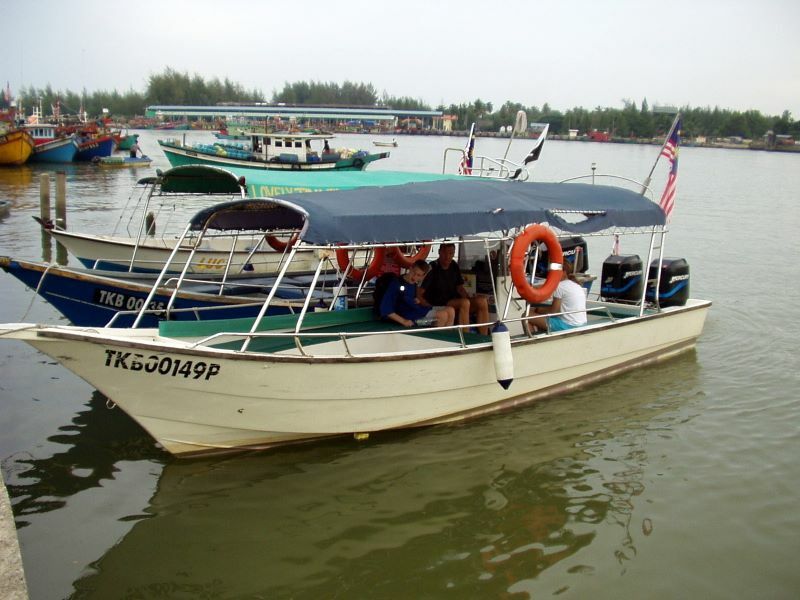 We are not sure of this departure point, but believe it was at or near Kuala Besut where a major river meets the sea. The boat ride out to the island was long even though the boat was fast. It was surprisingly more bumpy than expected. We quickly learned why locals sat in the back of the boat. Naive tourists sat up front for a great view, but where the fast boat's bow regularly slapped the choppy water.